The RockShox Recon Silver RL fork is a bombproof suspension fork that combines Reba's lightweight chassis with Sektor's strength and stiffness. The 32mm steel stanchions effortlessly slide along RockShox' low friction seals, providing 100mm of smooth travel. Reach down and give a quick twist of the compression adjuster to go from fully active to locked out. Choose the remote option and you can easily activate the lockout from your handlebars. Solo Air spring lets you add or remove air for infinite adjustment to suit your riding style. The tried and true Motion Control damper keeps you on point in any condition. Buyer beware when looking to purchase this shock. The picture is not the product you receive. I purchased this shock based off the picture displaying NO post mount brakes. The detailed description however does state this. I wish I would have read the description. Looking for a possible replacement fork with no post mounts. The photo shows a tapered steer tube but the description says 1 1/8. Can anyone please confirm if it is actually tapered? Thank you. How long is the Steer Tube for this fork? Is this a Recon Silver RL or TK? The title of the description says TK, but the description says RL. Is the fork compatible with V-Style Breaks? BEST ANSWER: Yes. I just received this fork about 3 weeks ago and it came with mounts for both v brakes and disk brakes. The picture doesn’t show it because the v brake mounts are removable if you don’t need them. Yes. Despite the photo showing otherwise the fork as delivered has the provisions for V brakes. Hi I have a 2005 Giant Reign 1 and it has a Manitou Nixon Fork. Would this Fork work as a replacement to the Manitou Fork I have? Unfortunately, I don't have quite enough info to give a solid answer, but I can give you some tips on what to make sure matches for compatibility. 1) Whee lsize: Given your bike model, this looks correct. 2) Steer tube size: Again, this looks right for your model bike. 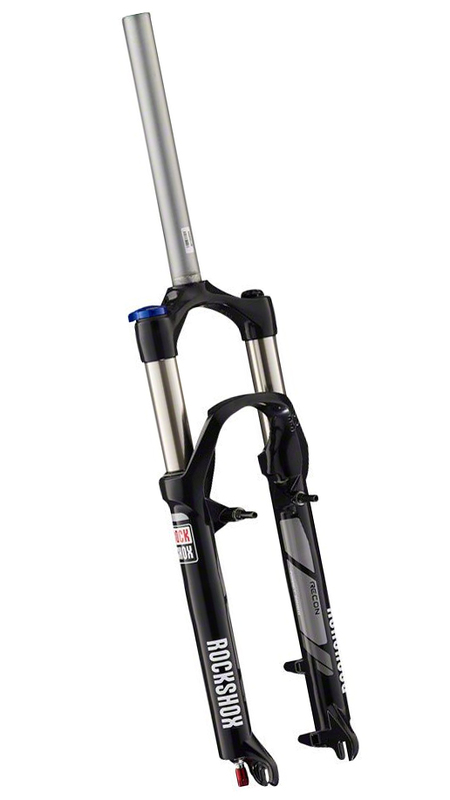 3) Travel: I think the Reign was around 140mm for the original fork. This looks to be only 100mm, which would be too short. 4) Brake mount compatibility: Adapters can usually make this work even if they don't match. I'd recommend hitting up our Gear Advisor team so that they can ensure that we get you a compatible fork, 888-880-3811. The specifications say it’s a quick release but the photo shows a nut axle? Somebody please help. BEST ANSWER: The one delivered to me was QR. Is the fork white with v-brake bosses? BEST ANSWER: These come with V-brake bosses. The color is also a selection in the drop down. Is it possible to use volume spacers with this fork? Will this work with rim brakes?